I get why reboots in comics have to be a thing, I guess. Unless you are a character with a built-in plot device explaining why you aren’t as old as the historical events to which you are tied (see: World War II era characters Captain America having been in ice for X-years or Magneto having been de-aged to a baby at some random point in his life), reboots are essential because comics that are published for 50 or more years eventually long outlive their references. You just have to wish Marvel and DC were better at their reboots than they perpetually have been. Eh. Oh, this has nothing to do with today’s book other than that I am reviewing a relatively old story, and it got me thinking. Just the musings of a crazy person. After years of being a Marvel fixture and building vast swaths of the Marvel Universe—including handfuls of characters who are some of the most recognizable on the planet now—Jack Kirby eventually bolted for the Distinguished Competition in the hopes of getting more recognition, more control, and more money. He got… very few of those things, because Kirby’s brilliance at being a creator and an artist was only matched by his ineptitude as a businessman. Jack Kirby’s life is a terrific metaphor for America, really, but that’s a different article. When the King reached DC, he brought with him an idea he had reportedly planned to use in The Mighty Thor… The Fourth World and the New Gods! After the destruction of a realm of gods, two worlds were born in the aftermath… New Genesis and Apokolips. The denizens of New Genesis because a beautiful, powerful race of “new gods” who lived in peace and watched over the universe; those from Apokolips were monstrosities ruled over by the incredibly powerful Darkseid, who would go on to become DC’s most prominent large-scope villain. Locked in the perpetual stand-off, these two world were filled with gods and creatures that would become staples of DC. The New Gods are an aspect of comics that has always existed just off of my comic fan periphery. I never had anything against them, but in my childhood, I was primarily a Marvel guy, and when I finally got into DC in college, there were so many other comics I got into instead. I have read a sampling of books that the characters have appeared in like Darkseid vs Galactus or Cosmic Odyssey, but I had not read New Gods or Fourth World books directly. They somehow always just stayed slightly off my radar. Until now! The one thing I really got a kick out of upon reading this is that Orion ends up journeying to Earth early on and taking up a secret identity. And that guise is… “O’Ryan”. Ha! That’s barely even trying. Still, Orion never really struck me as a “secret identity” kind of hero, and here he adopts one and creates a posse with four humans he saves from the clutches of Apokolips, O’Ryan’s Gang. These four indebted humans follow Orion around and work with him to figure out what Intergang is up to, and together they are determined to never let anyone else be harmed by Darkseid’s machinations again. New Gods is, for me, a book that causes a bit of an internal conflict to judge, and yeah, I’m about to level a critique against Jack Kirby, so… look, I’m already feeling bad enough about it, you don’t need to pile on! On the positive side of things—and there are many—this is a book drawn by The King, so it’s gorgeous. Everything is stylish and intense and detailed. The panels erupt with energy and intensity, and every punch or every beam of energy is crafted to give the reader maximum impact. As an artist, Kirby is beyond reproach. Even looking past that, this is a wonderful mythology of realms and characters that Jack created… even after just reading the first half dozen issues, you can appreciate. Kirby clearly had this design in mind for quite some time, and he brilliantly weighs unleashing all of his ideas upon the world against not burdening the reader with too much information too quickly. Aspects of the Fourth World are meted out in careful fashion, and the imagination of Jack Kirby is as glorious as ever. This is a marvelous world that Kirby introduces to, and it looks amazing. But the writing. Whoof, this writing. To put it simply, no human being alive has ever spoken the way a Jack Kirby character talks. Everything is bombastic, and it all spells out every base feeling or action that character is going through. It makes Stan Lee’s scripts look like a master’s class in subtlety. The members of O’Ryan’s Gang in particular are rough in their perpetual announcing of their own full names and identities (If there is one last thing I will remember in the fog of my old age while I lie on my deathbed, I assume it will be that Victor Lanza is just a humble insurance executive because Jack had him remind us of that constantly). I get that it may come from the idea that “every issue is someone’s first issue”, but there has to be a less clumsy way of handling this. The plots and the stories themselves are basic, but I also am just judging the first six issues for this article, and it’s possible they develop more maturity as they go. It’s all pretty “monster of the week” in the early running. It’s hard to be that critical when comics of the 60’s were a basic lot to begin with, but still… you kind of wish the dialogue and plots matched the art and scope of design. Talking Point: Well, we’re dealing with The King, so really anything could work here because the guy is a legend. First topic that comes to mind: What is your favorite Kirby creation and what is your favorite Kirby run on any book? There is a disparity in this book where some aspects are fantastic and others are inadequate. It’s really unfortunate, but if you chalk the underwhelming writing up to “that’s just how comics were in the day”, there is a LOT here to enjoy. It’s not perfect, but it’s a fun book that meant the world to DC going forward. Kirby’s dialogue was so bad that even his friend & admirer was basically like “yeah, the writer is un-good in these”. I think that’s overly harsh, guys! I really enjoy Jack Kirby’s Mister Miracle and Devil Dinosaur books personally. 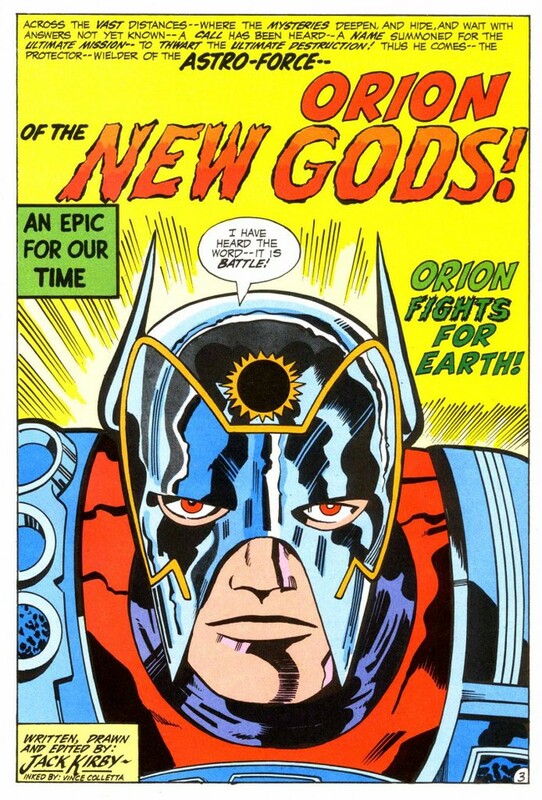 New Gods was not my favorite piece of Kirby, but like you i think it works on some levels and isn‘t bad either. But Mr. Miracle (Andy reviewed it here, not very long ago) is far better. One thing i don‘t understand is, why it is Vince Coletta inking both books?! I mean, why?! WHY?! The Inker was and still is a very underestimated part in making comics. Back then in this aera of pen and paper he was even more important for the look of a book. A good Inker just makes an artist better. Vince Coletta worked on a lot of books from both, marvel and DC – and i never seen him making better anything. The opposite. This guy had such a dominant style (in a bad way) – he was the first thing you‘d recognized, while browsing through a comicbook he inked. Like : „Shazbot! Coletta again?!“. He „destroyed“ the work of so many artists over the years, i never got, why he was like a big name in the buisness. As for Kirby : His artwork always looked good, even with Coletta, who, i have to admit, did relativly solid work (for his standards) on New Gods or Mr. Miracle. But with the right inker Kirby could really, REALLY shine. Take for example Kirbys Fantastic 4 and compare the artwork before Joe Sinnot came as inker – and while he was. Two different worlds. Joe Sinnot really brought out the best of Kirbys talent. Together they formed a dream team in my opinion – like Buscema / Palmer in later years, they were just made for each other.